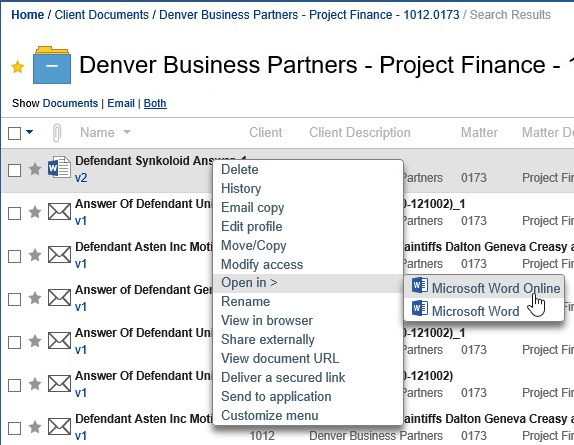 NetDocuments, the cloud-based document and email management platform for law firms and corporate legal departments, today announced its integration with Microsoft Office 365. The integration allows users to create or open Word, Excel or PowerPoint files stored in NetDocuments using Office Online web apps or Office mobile apps, and then save them back to NetDocuments without using OneDrive. NetDocuments users will also need an Office 365 subscription to take advantage of the integration. The integration offers users the advantage of incorporating NetDocuments’ security and information governance initiatives, by keeping content centralized in the firm’s DMS, while also allowing them to securely interact with Office 365, and to do all of this via the cloud, so they can work from any device. Work within Office applications from any browser and any device, including the ability to open, edit and create from any iOS device. Collaborate with real-time co-authoring and editing capabilities, eliminating the need to check documents in and out. Maintain a consistent interface regardless of location or device. Benefit from improved security and compliance by keeping documents within the DMS while using Office 365 applications. The integration allows users to both edit and create Office documents from within NetDocuments. To edit a Word document, the user would right click on the document name within NetDocuments and select Open > Microsoft [Word] Online. The document will open in the Office Online app directly, in a separate browser tab, and be checked out in NetDocuments. 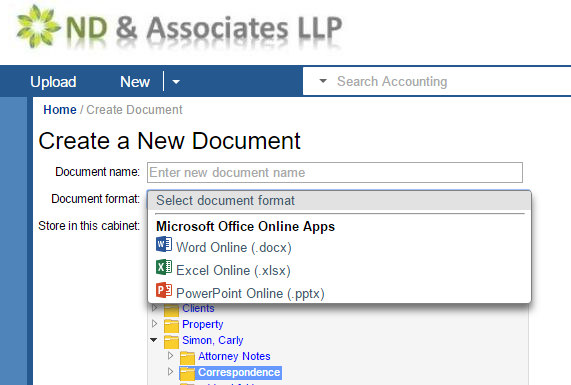 To create a document, the user would select New in the upper left corner of the NetDocuments web interface, give the document a name, select the Office format, choose a filing location, and then click OK. The new document will open in the Office app directly and be checked out in NetDocuments. Of course, some document information is shared between NetDocuments and Microsoft in connection with the integration. A support article explains that both user metadata and document content flow through the Office Online servers. Read the support article for more information on data sharing and also on using the new integration.